Launched by the Alliance to Save Energy, the Rate Design Initiative could help shape the way millions of Americans use and pay for energy in their homes. The Initiative has brought together representatives of utilities, technology companies, regulatory experts, environmental groups, consumer advocates and other industry leaders to identify themes and opportunities on utility rate designs that incentivize energy efficiency and other environmental and social objectives while also addressing adequate cost recovery for utilities. 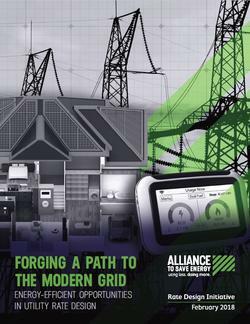 The Alliance’s Feb. 2018 white paper, Forging a Path to the Modern Grid: Energy-Efficient Opportunities in Utility Rate Design, informed by two years of stakeholder input, says that the transition to a modern electrical grid that is reliable, decarbonized and efficient will require changes in the pricing structures used by electric utilities – including moving beyond a traditional two-part rate. The paper provides broad guidance for parties considering a new rate design, including discussions of rate design elements that can provide customers with clearer price signals and greater control over their demand – focusing not only on how much electricity is used, but where and when. These options, if designed effectively and proven through pilots and educational programs, would help build a more energy-efficient, sustainable and responsive grid while allowing utilities to earn the revenues required to adapt the grid to its modern needs. Oct. 2016: Rate Design Initiative participants published a set of core principles guiding the work.